For a while there it really did seem like 2002. 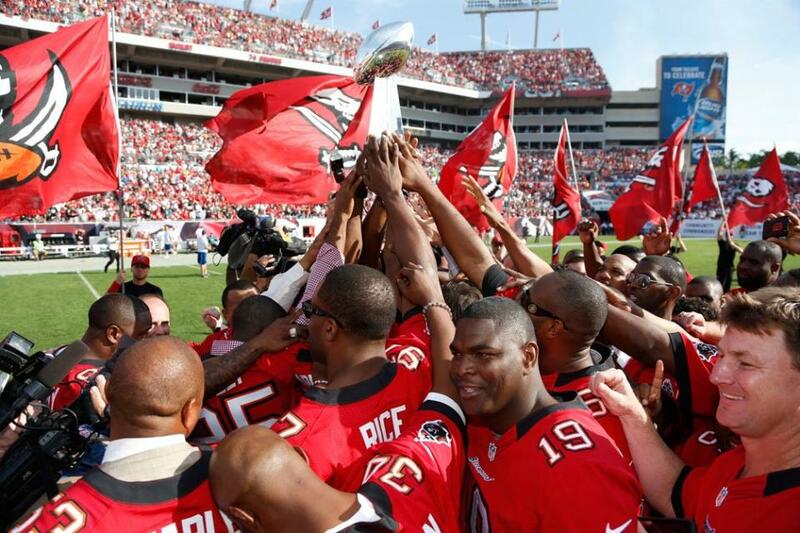 Much of that season’s Buccaneers team was in the house, celebrating its Super Bowl title, and for 57 minutes the defense was so dominant you might have sworn you were watching Derrick Brooks, Warren Sapp and Simeon Rice. Then, just like that, it was 2012 again. Given the responsibility of closing out the game — and it sure doesn’t get much more 2002-like than that — the Bucs defense succumbed yet again, this time to a rookie quarterback working with no timeouts and a little more than two minutes on the clock. The issue Sunday was quarterback Nick Foles, who racked up 59 of his 381 passing yards in the final 2:44 and hit a sliding Jeremy Maclin with a 1-yard touchdown strike as time expired to give the Eagles a 23-21 victory in front of a season-high crowd of 64,941 at Raymond James Stadium. Or maybe the issue was the Bucs. After all, they were penalized twice, including once for having too many men on the field, went 0-for-2 on fourth down and let an interception slip through their hands during that final 64-yard, 13-play Eagles scoring drive. The Bucs have made a habit of that lately. This loss, to a 4-9 Eagles team whose last victory came in September, was Tampa Bay’s third straight and all but destroyed what little hope they had of making the playoffs. Every other team in the chase for the NFC’s final wild card berth — Seattle, Dallas, Washington and Minnesota — won Sunday as the Bucs fell to 6-7, two games behind the leader of that race, Seattle, and one game behind the others. Not that the Bucs have looked much like a playoff team of late. Their offense recently fell into a slump that only widened during the first half against the Eagles. With Josh Freeman seemingly “out of sync,’’ according to Schiano, the Bucs gained just 79 yards and were shut out in the first half for the first time this season. The Eagles, meanwhile, took advantage of a couple of defensive breakdowns to score a late second-quarter touchdown and field goal for a 10-0 halftime lead. The Bucs got their offense in gear in the second half, building a 21-10 lead with 7:21 to play on a 1-yard Freeman touchdown pass to Mike Williams, a 13-yard Freeman touchdown pass to Vincent Jackson and a 4-yard scoring run by running back Doug Martin. The game seemed rather secure at that point, and the feeling remained even after Foles threw an 11-yard touchdown pass to tight end Clay Harbor to make it 21-16 with 3:55 to play. But everything changed after Schiano all but put the game in the hands of his defense. Facing third-and-8 from their 33-yard line, the Bucs ran Martin up the middle, hoping the Eagles would overplay the pass and create an opportunity for Martin to break free for a big gain. Martin, though, was stuffed for no gain, and Michael Koenen’s 26-yard punt didn’t help matters. What happened was the Eagles took over at their 36-yard line and steadily moved the ball downfield, gaining big and small chunks at key moments. They picked up 23 yards on a third-and-14 play from their 32. They converted a fourth-and-1 play with a 3-yard scramble by Foles and a fourth-and-5 play with a 22-yard pass. 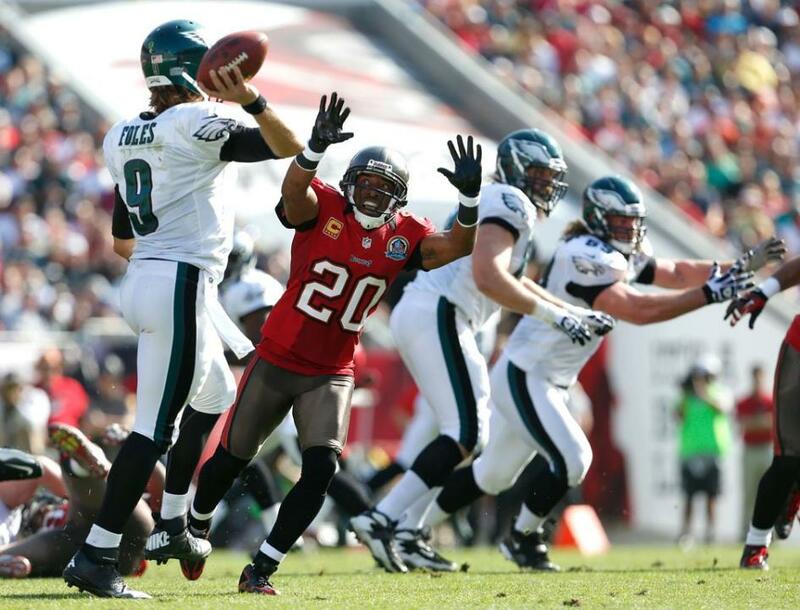 The Bucs’ best chance to stop the Eagles came on a third-and-5 play from the Bucs’ 23 with 22 seconds left. That’s when Foles dropped back and threw down the middle for receiver Matthew McNutt. Tampa Bay cornerback Danny Gorrer, pressed into duty by the losses of Eric Wright to a suspension and LeQuan Lewis to a knee injury, timed the route perfectly. For a split second, he had the ball — and the game — in his hands. Then he didn’t, the ball slipping out to give the Eagles new life. About an hour later, well after Maclin slid on his knees in the end zone to make the winning catch, Gorrer sat solemnly in a chair facing his locker, rubbing lotion into the hands that ever so briefly held the Bucs’ fortunes. That’s 2012 for you, in a nutshell.